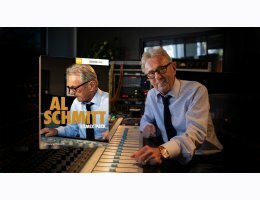 After close to nine decades on earth and nearing seven behind a studio console, with 160 gold and platinum albums under his belt, 23 Grammy Awards to his name and a star on the Hollywood Walk of Fame, Al Schmitt is arguably the most prolific and awarded man in the audio recording industry – ever. Welcome to an expansion for EZmix 2, engineered by the man himself. With settings for electric and acoustic guitar, vocals, drums, percussion, keys, bass and more, this EZmix pack will not only give you a broad set of tools to aid you in any facet of your mixing process, it will also get you inside the head of the audio visionary that is Al Schmitt. The amount of experience encapsulated within these 50 settings is hard to fathom or express in words. Luckily, there is always music. Let’s have that do the talking. Start mixing! In retrospect, figuring out that Al would end up behind a console is somewhat of a no-brainer. He literally grew up in a studio. Already at the age of seven, he hung out with his uncle Harry, who also was an engineer, to help set out chairs for musicians, clean patch cables and whatever came with being a helper during sessions back then. This was in the thriving days of the late 1930s New York big band and jazz scene. That scene was buzzing, with loads of work and studios scattered all over the city. From there, his path was pretty much laid out. Working his formative years under the tutelage of many of the era’s legendary engineers, he honed his craft before relocating to California. After that, the rest is music history. For real. In fact, Al Schmitt’s footprint in the recording industry is hard to fathom or even put down in words. Just the numbers alone are mind-boggling: 727 recordings, 160 gold and platinum albums and 23 Grammy Awards. Scrolling through his discography is even more daunting – his hands and ears have literally shaped our collective music history. From now immortal icons like Ray Charles, Frank Sinatra and Sam Cooke to Madonna, Michael Jackson, Quincy Jones, Barbara Streisand and Paul McCartney – Al has worked with them all.